Short grain white rice is what I grew up on, but I'm trying to eat more whole grains and they don't have short grain brown rice at Jewel. So for long grain brown rice: combine one part rice plus two parts water in a covered pot and bring to a boil. Turn heat to low and let simmer about thirty minutes, then remove from heat and let rest about thirty minutes. All of this is basically going on while you are preparing the vegetables. 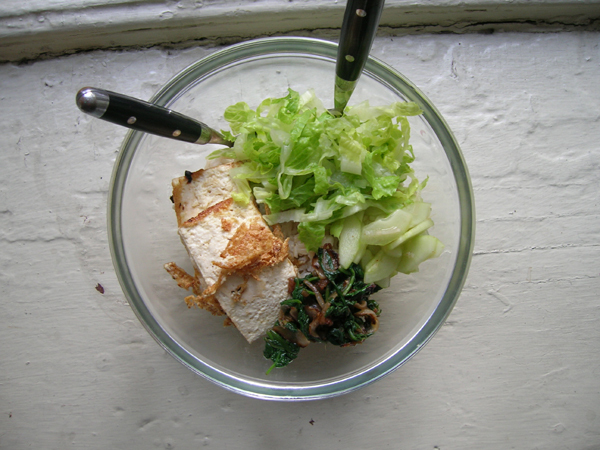 This time I'm mostly using up salad greens: lettuce is a little odd, but cucumber and spinach are pretty traditional for a Korean rice bowl. Also at the moment I don't have some of the usual ingredients for this, like sesame oil or crushed red pepper. Or red pepper paste, which is really the bomb. But anyway, this is my real right home cooking & more about improvisation and making do than anything else I cook. So I pick any three vegetables, season them with varying proportions of oil, vinegar, sometimes spice, sometimes soy sauce. 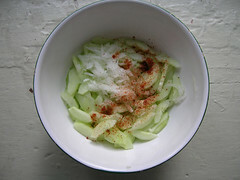 Also onion, green onion is more usual but instead I used up a Grampa Simpson onion that's been moldering in my pantry. You just play with the balances. 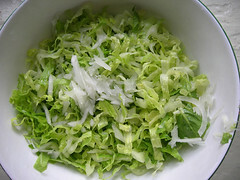 I thought the lettuce should be crisp and lightly dressed. I like cucumbers very vinegary and a little bit spicy. 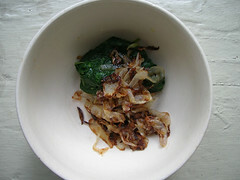 I blanched the spinach, rinsed and squeezed it dry, and carmelized whatever onions I had left in a bit of olive oil & tossed the spinach and onions together with a little bit of soy sauce, for a rich effect. The tofu got sliced in eighths, and the slices fried in the pan that I carmelized the onions in. I'm out of practice, so most of the crust stuck to the bottom of the pan. I removed it in pieces, with violence, because it is nom and good. I thought about not mentioning that the traditional thing that goes on top of a rice bowl is a fried e-g-g, but I can do without. Oh and also little bits of meat, but I never bothered with that. I like tofu, and actually I like tofu sliced right off the block. I made lunch bentos with the leftovers, with just fresh tofu; so that's an option, too.